After the allision of the "Emsmoon" with the Friesen bridge in Weener in the Leer municipality the Ems remained closed for ship traffic apart from smaller barges. On Dec 8 removal of wreckage of the bridge commenced after the Dutch sheerleg "Triton" has arrived at the accident site the previous evening. The work which will be supported by divers was expected to last several days. It was hoped to reopen the Ems for all ship traffic on Dec 11. Meanwhile the analysis of the voyage-data-recorders of the ship were in the focus of the investigations of the prosecutors i Aurich. Another question was who was at the helm of the "Emsmoon" when she slammed into the bridge. There was suspicion that the pilot himself had took over steering the ship at that time as the Russian master of the ship was unable to communicate in German. Neither the master nor the pilot have testified yet. There was no suspicion of alcohol consumption. 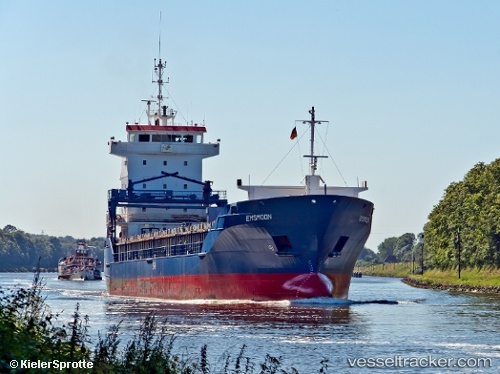 The water police in Emden launched an investigation against the 53-year old Russian master of the "Ems Moon" and the 57 year old pilot due to endangering ship and railway traffic. The porsecutors in Aurich will decide about a safety fine on Dec 7. Both men refused to be interrogated by the authorities.